ITINERARY: Drive to Yorkton on Friday, stay overnight, start exploring early Saturday morning, return home Saturday night, brief the rest of the family Sunday after a big Thanksgiving meal. TEAM MEMBERS: Anita, her husband Nelson, their son, JJ. This year in Canada, Thanksgiving fell on the Oct 11th weekend. With the weather promising to be the waning days of Indian Summer, and with JJ at home and Nelson on days off, we decided it would be the last chance this year to head north on a journey of discovery. On Oct 9th, we picked JJ up from school and headed northeast. 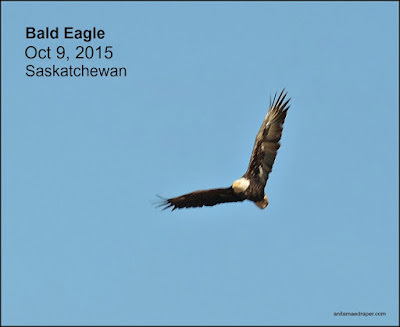 We had driven about an hour when I spotted what would be the first of three bald eagle sightings over the weekend. 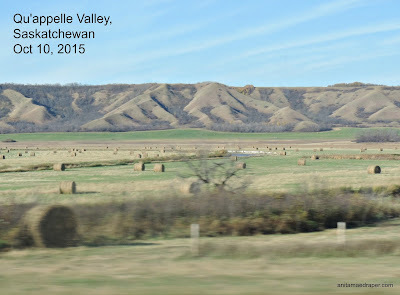 Shortly after, we began the long drive down and across the scenic Qu'appelle Valley. The addition of huge straw bales created an attractive layer to the usually flat floor of this wide valley. The sun was setting when we arrived at our hotel in Yorkton. Although I visit this city every year, I've never taken the time to explore its historic past and alas, it wasn't part of the mission for this weekend either. The next morning, we drove through Canora with its 25 foot tall statue of a Lesia, a Ukrainian woman in traditional dress holding the symbols of welcome - bread and salt. We really were in the land of the Ukrainian heritage we were seeking on this trip. 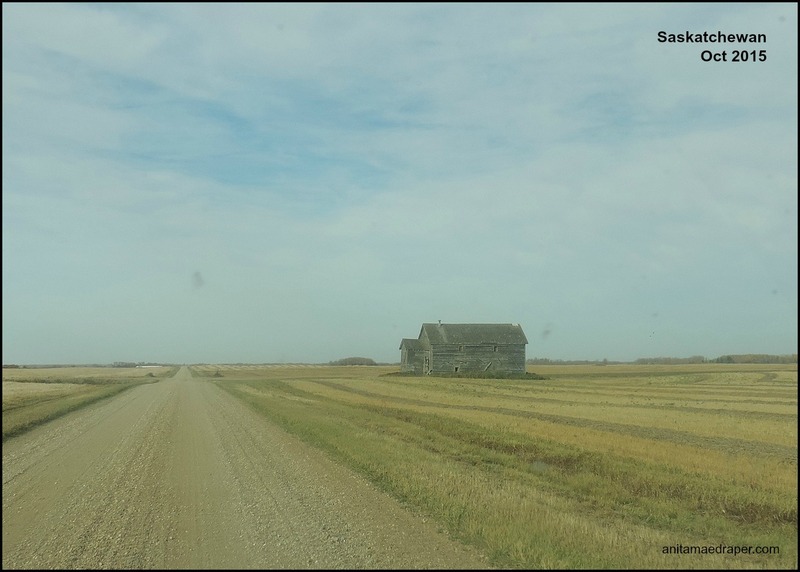 Soon, we left the main highway and struck out on a gravel road in search of our first stop. I had my camera in hand and so was ready when Nelson spotted a coyote hiding under a grainary. By the time he slowed, the coyote was on the move, but I was able to take some shots and a short video. 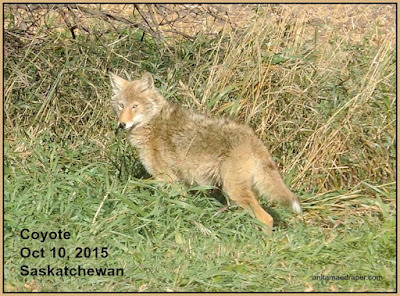 You can watch the Saskatchewan Coyote video on my YouTube channel if it isn't showing up here on this post. This area was surveyed and settled in the first decade of the 20th century and you can still find the ruins of early 1900's homesteads if you look. This following image shows an original log house that has not only fallen, but is being taken over by the surrounding trees. 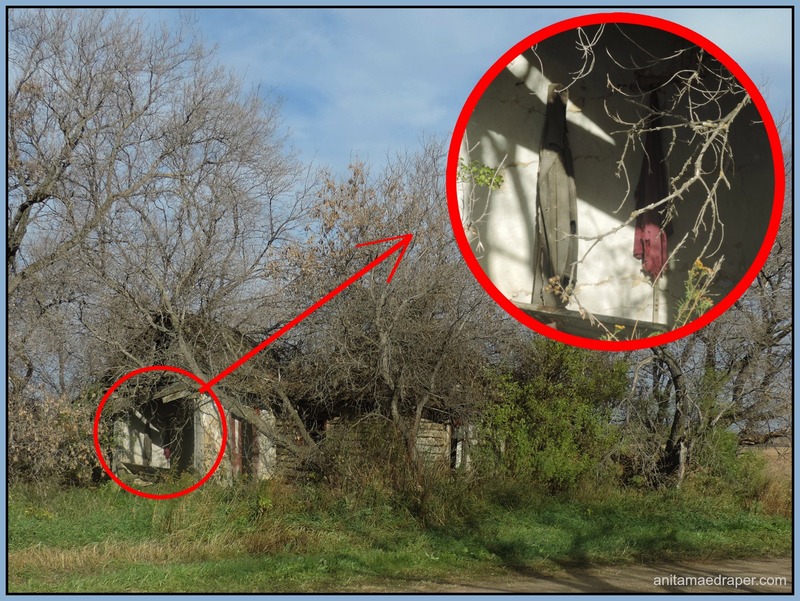 I zoomed in on the clothes still hanging in what appears to be the porch. Of course, that got my imagination soaring with possibilities as to why someone would walk away from their house and leave their clothes behind. I wonder who lived here and the circumstances of their life. The building in this next image could be a school or homestead. It looks like an old school, yet there are old School District markers throughout the province to show where a school stood. Sometimes they have a bell, and sometimes they include a mini version of the original building. Farther down the road we see several windblown evergreens standing like sentinels in a field. 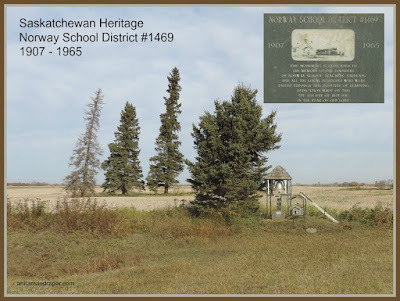 As we approach the spot, we notice the school marker for Norway School District #1469 which first opened in 1907 and closed its doors in 1965. 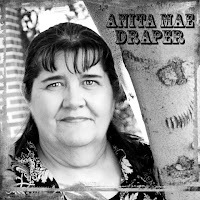 To find our first destination, we are using the Find-a-Grave app on my iPhone. This free app is the best resource tool I have for finding lost cemeteries as well as lost relatives. It works with GPS and shows all the cemeteries around you. 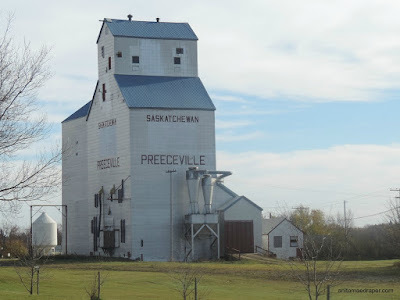 For this journey, I set the location for Preeceville, which is the biggest community close to our area of search. The Find-a-Grave app shows 2 colours of cemeteries... green and orange. The orange ones mean there is a photo request from someone who wants an photo of a loved one - usually to confirm the birth and death dates as well as final resting place - yet for whatever reason they can't physically come to the cemetery and take the photo themselves so they put in a request. A volunteer will take the photo and post it on the Find-a-Grave site for them. Since there are times I have reqested a photo, I give back by being a photo volunteer to others. 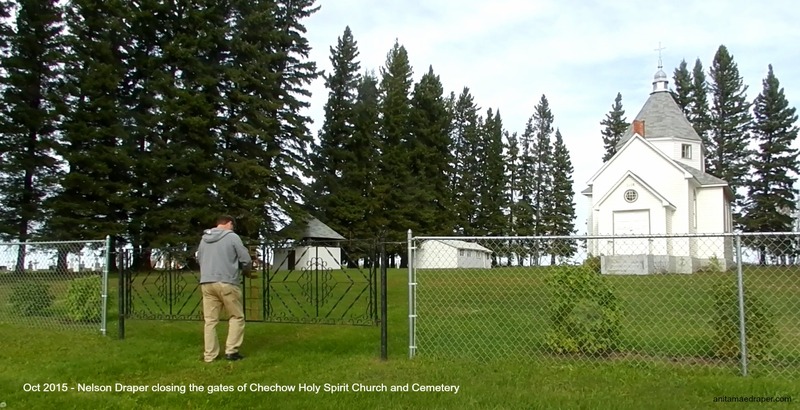 Using the app, we head to the green image designating the Chechow Church and Cemetery where many of Nelson's ancestors are buried. As we park in front of the gate, I experience a surreal moment because I've seen it in so many photographs and it's hard to believe we're finally here. Nelson's 2 x great-grandfather (JJ's 3 x g-grandfather) John Holowachuk helped build this church along with his son Danylo (Daniel) and other family members. As blacksmiths, both men crafted many of the iron crosses which stand in the cemetery, although the hand-wrought iron seems to be disappearing at an alarming rate. We spent almost 2 hrs in Chechow, with 3 different cameras to ensure nothing is missed, for this place is special in its own right, but this is not the post for that story. We continued west after a brief picnic and suddenly I yelled to stop the car. 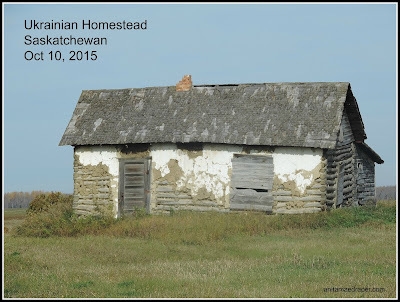 Standing near a copse of trees and bush was a house I believe was a Ukrainian homestead. It didn't have the thatch roof that the Ukrainians used when they first arrived, but the wall construction was exactly as I had read about. In the photo below, you see the original part of the house made with logs. They are not saddle-notched like the Swedes do, but sit atop each other at the corners, and then are chinked with a mixture of clay and straw. Over this is spread another layer much as you would put stucco on the exterior of the house. And finally, the whole thing was whitewashed. I am so excited to have this photo which shows the layers of construction. 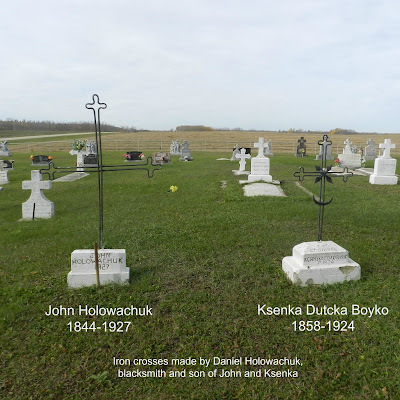 Following the app, we stop at the green-coloured Hazel Dell Ukrainian Catholic Cemetery. We only need photos of a couple headstones here and we are soon on the way again, driving north through the hamlet of Hazel Dell, which I've read so much about in the local history book. But nowadays, it's one of those place you'll miss if you blink, and we are soon past it and pulling into the 3rd cemetery on our journey. Here at the orange-coloured Hazel Dell Community Cemetery, there are no Ukrainian relatives, but there are 2 photo requests to fill. The graves here are spread apart in the field so we each take a segment. When we join together again, we realize the graves we're looking for aren't here. However, I thought I saw them back in the Hazel Dell Ukrainian cemetery. Since it's only a few miles back, Nelson says we might as well check, so back we go. As we get closer, we see a car and know that someone else is now visiting the Ukrainian cemetery. That's good to visit loved ones on this beautiful Thanksgiving weekend. As JJ goes to search for the missing graves, Nelson strikes up a conversation with the other visitors - quite a novelty for him. Soon, he wants me to join him. When I'm introduced to the woman, I blurt out that I had been reading about her that morning. It's true! I had been looking at the family tree before we left the hotel. Her name is Leona and she is the cousin of Nelson's mother. It truly was a God-thing to stand there and talk to family members we'd never met. And it would never have happened if we hadn't gone back in search of fulfilling photo requests. Oh, what fun we had telling that story to Nelson's mom and everyone at the big family Thanksgiving meal the next day in Regina, but I'm getting ahead of myself. With our hearts lighter, we took the necessary photographs and headed north once more. 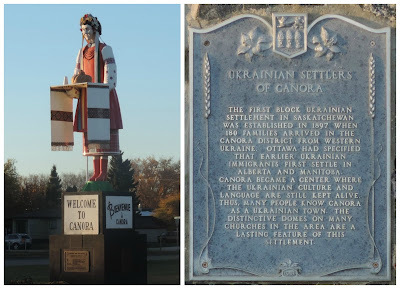 On the main highway, we turned east for a few miles and then stopped at St Mary's Buchach Ukrainian Church and cemetery, The Ukrainian immigrants named this place for the village they'd left behind in the old country. The headstones here ranged from old crumbling cement with illegible Cyrillic writing to modern renditions with engraved images. Several iron crosses stood with blank name plates - the letters weathered away from the elements. We took the dozen or so photos we needed and several we weren't sure about, and continued east. Nelson drove us down the lane on the east side of the quarter, but the trees and bush were so thick we couldn't see through, so the photo above was taken at the north east corner. What's left of the house is on the right, down past the river, and Nelson's mom says it's probably too overgrown with trees to see it from the road now. We didn't see any white from the white-washed walls at all. It may even have fallen by now. But at least we were there to see the land where Nelson's grandmother was born. 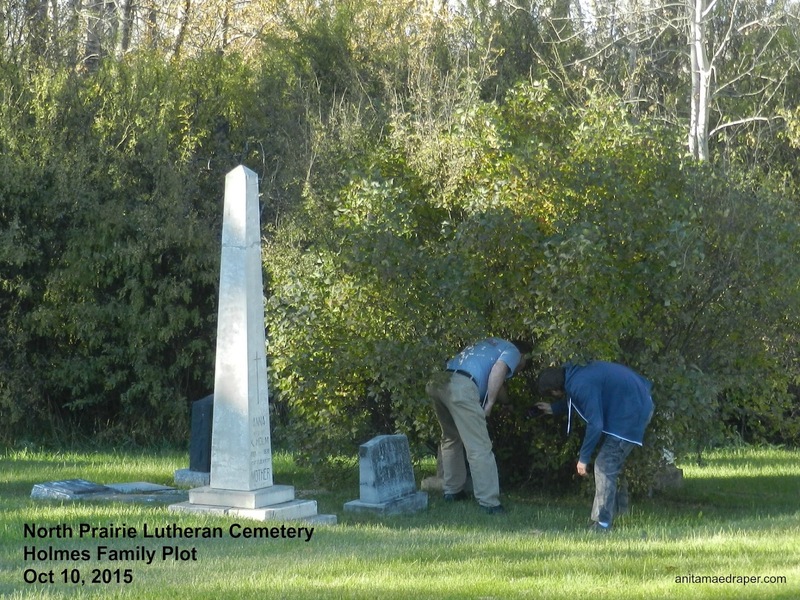 After a brief stop to rest and eat in Preeceville, we headed north to the North Prairie Lutheran Cemetery. Two of Daniel Holowachuk's sisters married into the Holmes family and I have made on-line friends with a family member who would like photos. As well, the app shows it's an orange cemetery and I see there are two photo requests from someone else. 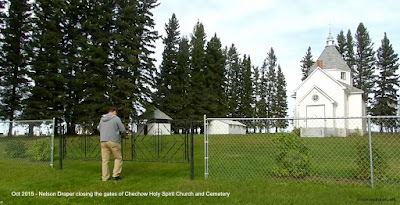 It's a well-kept church and cemetery, although one of the family members is under a bush - and it happens to be the spouse of one of the Holowachuk girls, so the guys work together for this one. With the sun in its final hours, we head back to the Preeceville Community Cemetery where the final graving will be done. It doesn't take long to find the ones we need, but we don't fulfill - why do they use fulfill instead of just fill? - any of the 10 open photo requests here, They are all from different families and will take time to locate - time we don't have any longer as we still have the four hour drive back home. And there ends our Ukrainian family heritage tour. The following day we celebrated Thanksgiving with Nelson's family which included his mom, who was very interested in our journey. She surprised us by bringing a photo album which included several pics of her as a youngster - and one of her as a baby! It really was a lovely weekend filled with blessings all around. Have you gone back to see the land of your ancestors? Would you if you had the chance? Looks like a great road trip! I like how your family gets involved too! The Qu'appelle Valley is so beautiful, especially in the fall. Just curious as to how many story ideas flooded your mind during your explorations? :) Hope there were lots! Haha, Elaine, you know me well. 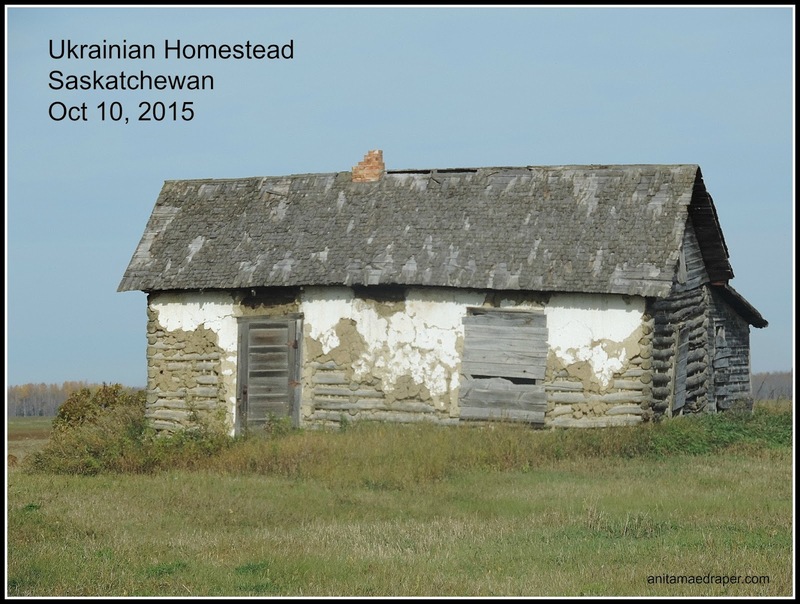 Almost every homestead brought ideas, as did the wildlife and many of the cemetery headstones. Nelson mentioned several times that the land we were driving through had once been bush until the settlers cleared the land. He wasn't saying it for knowledge, but more in amazement that his ancestors had left such a legacy. Happy Belated Thanksgiving! What a wonderful trip. Thanks for sharing the photos--as usual, they are amazing. 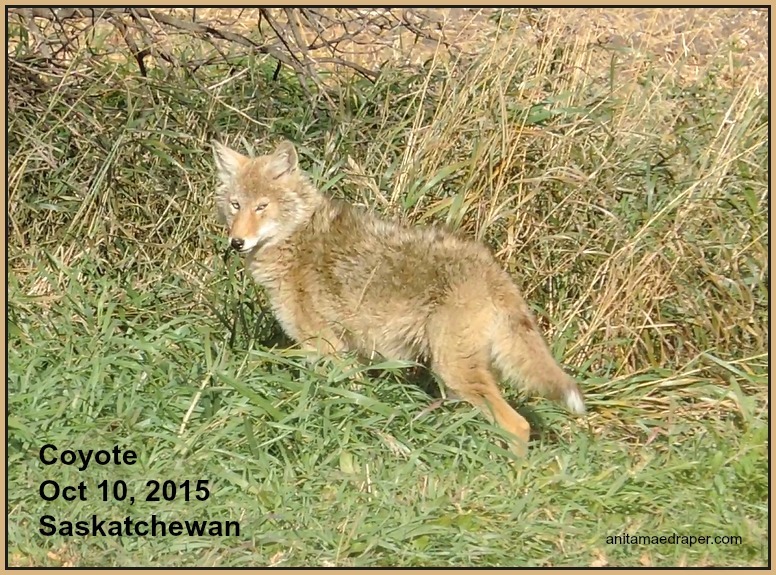 Coyotes in SK are much plumper than coyotes here, lol! Ours are so scraggly and mangy. Thanks for the Thanksgiving greeting, Susie, as well as the nice words for my pics. Thoroughly enjoyed this post! Thanks for sharing your trip and Happy Thanksgiving! A few years ago I got to travel back to Pennsylvania from Virginia and visit the town I grew up in. I didn't get to visit the cemetery, however. I would have loved to have seen my ancestors' grave sites first hand. Great post!